In previous posts, we looked at popular failed strategies used by highsec miners who resist the New Order, including the Carebear Stare and counter-bumping. Some people assume just because highsec miners do nothing but repetitively, mindlessly click and drag ore/ice into their ship, that somehow the miners themselves are dull or stupid. Not so. They operate on a few levels below the Agents of the New Order, of course, but when miners are actually at their keyboards, sometimes they use their brains. Today's post sheds some light on the ways miners attempt to use psychological tricks and misdirection to derail the bumpers from their noble path. One of the most common devices a miner will employ is reverse psychology. They might, for example, pretend that they are not bothered by being bumped out of range. This tactic is of limited usefulness when the bumper leaves local and other Agents record the miner exploding with rage about the unfairness of being bumped, and urging everyone to join him in filing petitions. Sometimes a miner will try to justify being bumped, declaring that he's keeping the bumper preoccupied and saving the rest of the miners from suffering the same cruel fate. This is such a common refrain that it has its own square on Miner Bingo. Note, however, that sometimes this declaration is actually a disguised plea for other miners to compensate him with pity isk. ...But at other times, it's just a defense mechanism. When such tricks fail, miners may get more direct about their misdirection, hoping to send the bumper off to another system. We saw an example of this just yesterday, as the New Order annexed the Uotila system. Miners frequently urge me to protect the capital of our territory, the birthplace of the New Order: Halaima. 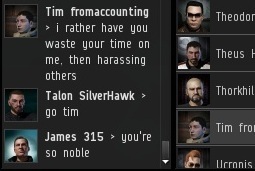 "Go to nullsec" and "go to lowsec" are popular refrains from miners who have never set foot outside of highsec. Less common is the "go to wormhole space" variety. But whatever the suggestion is, it's always for the bumper to go somewhere else. Of course, we all know that this is folly. The Supreme Protector bumps whomever he chooses, whenever he chooses, wherever he chooses. The miner has no say in it, apart from paying the 10 million isk he owes as a mining fee. Any attempt to manipulate bumpers with psychological warfare is just another example of Things That Don't Work.